Fishing with powerbait can be quite effective if done properly. Still fishing is the best way to use this kind of bait. It is not as effective in streams or other moving bodies of water. Most powerbait comes in little jars, and you simply roll it into a ball around the hook on your line. 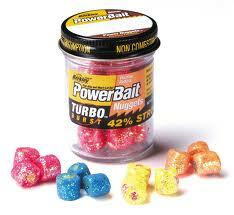 Powerbait comes in many different colors, and can be effective for different species of fish. The label on the jar will say which species that particular color of bait is meant for. A good baitcasting reel equipped with no heavier than six pound line is the exceptional combination with the bait. The baitcasting reel is more of a personal preference, as long as it is a quality model. After securing the bait, simply cast out and wait for the fish to bite. There is no special technique for reeling in. This entry was posted on Monday, April 4th, 2011 at 9:44 am	and is filed under Fishing Equipment, Lures. You can follow any responses to this entry through the RSS 2.0 feed. You can skip to the end and leave a response. Pinging is currently not allowed.